Spain finally bowed to the rising interest rates and the billions of euros worth of bad loans at Spain’s regional governments to ask for a loan. After emergency talks between Euro Zone finance ministers on Saturday, Spain will get up to $125 billion from the European Union (EU) to bail out its banking system. The move came three weeks after Bankia, the nation’s fourth largest bank, asked the government for a $24 billion bailout. Spain’s economy and financial system are still reeling from the collapse of a massive real estate bubble (house prices have dropped by 25% since 2008) and the subsequent Great Recession. 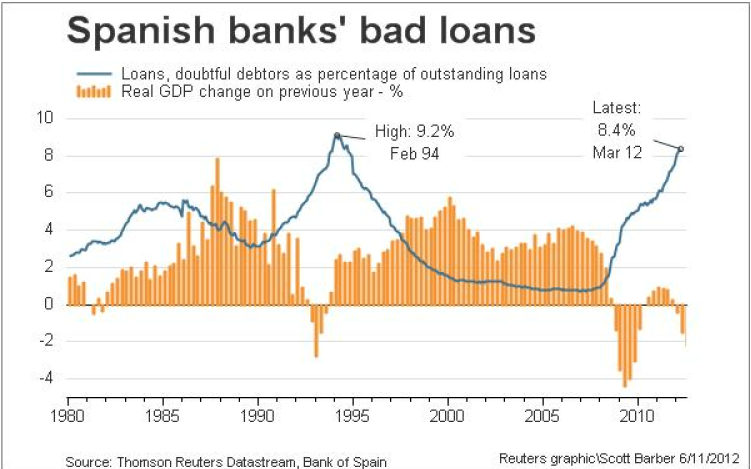 Bank bad loans as a percentage of total lending jumped to 8.4% in March, the highest since August 1994, and a majority of Spain’s financial institutions are saddled with debts much greater than their assets. The $125-billion aid sought by Spain is about 270% of the amount estimated by an IMF study released June 8, but close to the $126 billion projected by a report from Fitch Ratings released on Friday. The aid money will come from two funds – the European Financial Stability Facility (EFSF) and the European Stability Mechanism (ESM). This bailout may give investors and markets some calming effect, but will not resolve the fundamental debt, deficit and economic problems of Spain. Spain has the highest unemployment rate in the EU at 24.3% (its youth unemployment is at a staggering 51.5%), even worse than Greece, while GDP is set to shrink 1.8% this year, according to IMF estimates. So the odds are very good that Spain may need more bailout down the road. Spain marks the fourth bailout during this Euro Zone debt crisis saga, after Ireland, Portugal and Greece, and may need more aid money, while Italy is looking good to be the fifth bailout candidate. According to BusinessWeek, the bank bailout could add up to 10 percentage points to Spain’s debt ratio, which should peak at about 100% of GDP in 2015. But that’s still a lot less than Italy, whose debt is over 120% of GDP. 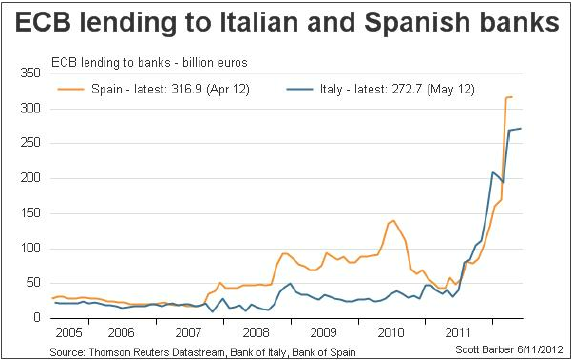 Although Italy runs a lower deficit to GDP ratio than Spain, Italy is also facing soaring borrowing costs, and relying on ECB for funds (See 2 Charts Below). 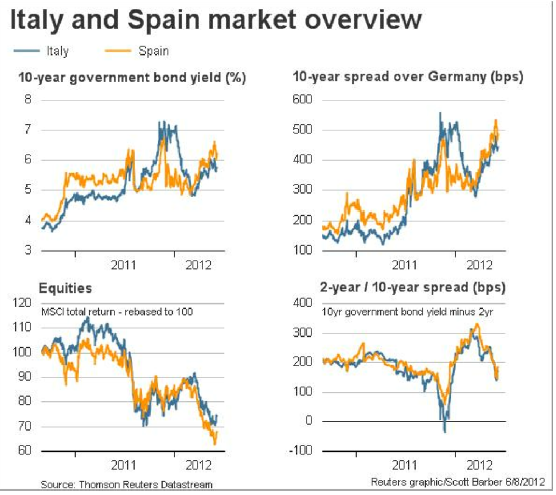 Even with the Spain bailout, there are still many moving parts in this euro debt crisis. Greece might choose to exit of the Euro depending the outcome of the election on June 17, which could have catastrophic contagion effect on global markets. 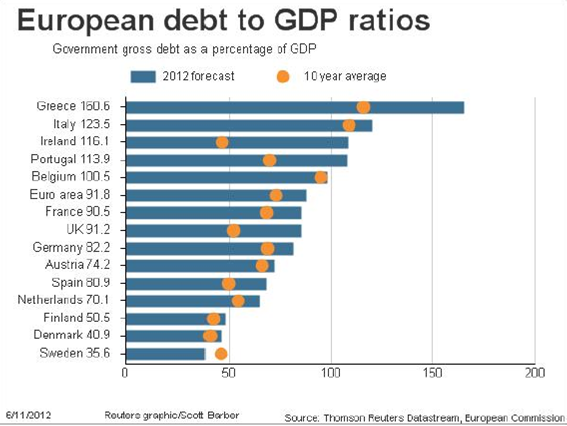 And if you take a look at Euro Zone debt to GDP numbers, there’s a good chance the sovereign debt crisis probably would not stop at Italy either. The situation has become so critical that European leaders reportedly are working on the issuance of joint euro bonds to rescue euro. That might save the euro, but here’s one scary question for all–How long can this bailout train and money printing press keep on running?